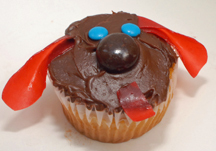 My friend’s sweet little girl is having a puppy-themed birthday party and I suggested these easy puppy dog cupcakes. The ears and tongue are made from cutup fruit rolls! What You Need: 1 cupcake; chocolate frosting; red fruit roll; Junior Mint, malt ball or other round brown candy; 2 blue mini M&Ms; scissors. How to Make It: Frost cupcake. Cut fruit roll into ear and tongue shapes (you can do this freehand with kid-safe scissors or–adults only–a knife, and you can make a template from paper or cardstock first if you need to.) Bend short ends of ears slightly and insert each near top of cupcake. Add tongue to bottom. Place chocolate in center and add eyes. There are lots of variations you could make. Use white frosting and black gel icing for Dalmatian cupcakes and so on. This entry was posted on Saturday, May 16th, 2009 at 2:01 pm	and is filed under animal cupcakes. You can follow any responses to this entry through the RSS 2.0 feed. Responses are currently closed, but you can trackback from your own site.